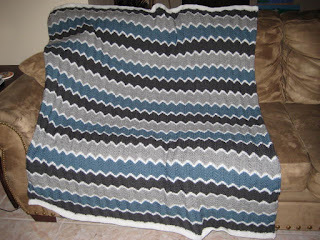 Mr. Grumpbump's blanket is finished! This ripple stitch pattern is my absolute favorite; it seems that no matter what colors you pick, the blanket is so striking. Definitely something I will do again. I've started on a new project, which I chose based solely on the ease of getting in on my needles and the quickness of the knit. It's called a Baktus Scarf. I'm using sock yarn to knit this and I will probably buy some beads to add to the ends of the scarf (a lot of the scarves are made with tassels at the end). 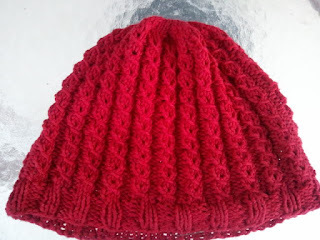 If this turns out as cool as I hope, I might use up my other sock yarn to make this very easy knit. Right now, it remains to be seen how it will turn out.